Taiwan Expo 2018 is set to be held at the Kuala Lumpur Convention and Exhibition Centre (KLCC) from 25th to 27th of October and will feature twelve major exhibition pavilions covering eight industry sectors. This year marks the second consecutive year that Taiwan Expo is here in Malaysia and many exciting products are up for display; showcasing the scope and depth of Taiwanese research and development in a wide variety of field. Amongst the key exhibits include the world’s first collaborative robot with intelligent visual positioning and the first ever mobile phone 3D printer. Last year marked Taiwan Expo’s first ever outing in Malaysia which attracted some 20,000 visitors over its three day run, and generated business opportunities worth USD 36 million. Halal products and smart technologies received plenty of interest and up to 88% of trade visitors expressed the desire to visit Taiwan. The overwhelmingly positive reception underscores Taiwan Expo’s success in promoting the image of “Taiwan Quality” to Malaysians. The Taiwan Expo 2018 is themed Connect Taiwan, Connect the World, and will feature 250 booths by 200 companies covering a wide range of categories such Smart City, Green Tech, Healthcare, Halal Taiwan, Taiwan Lifestyle and Tour Taiwan. These categories will showcase the advantages of Taiwanese high quality products and services in areas such as cuisines, fashion, living, cultures, tourism and many more. Taiwan’s cutting edge technology will also be prominently featured across the various themed exhibition sections under the banner of Taiwan Excellence that showcases outstanding general products; Digital Commerce & Startups brings together the leaders in ecommerce field; ICT Products features Taiwan’s dominating position in the field of internet and communication technology; Smart Health Station that integrates smart technology into healthcare services and many other amazing innovations. Visitors will get a chance to experience a sneak peek into tomorrow’s smart future with these the latest technologies. Taiwan’s strong R&D culture, production capability, product packaging and marketing puts it amongst the best in the world. Take the Internet of Things (IoT) for example, it encompasses all aspects of life such as smart cities, smart homes, rest and recreation and smart appliances to provide seamless convenience as the path to the future. The dynamism and culture of innovation in Taiwan has allowed it to remain at the bleeding edge of technologies for decades and is a world leader in e-sports, VR technology and consumer technologies. The Smart Bus system that monitors drivers and reminders to improve drivers’ alertness and the 24-hour automated smart waste recycling notification system allows visitors a glimpse of the future. The world’s first collaborative robot with intelligent visual positioning that can identify objects based on many parameters such as shape, position, colour and embedded code will change the manufacturing landscape for years to come. Green technologies will also be featured prominently under the banner of smart cities green technology solutions, green building material for sustainable development, and technologies that promote environmentally responsible lifestyles. Malaysia plays an important role in halal certification globally and has long been one of its strongest advocates. Taiwan has been developing its halal industry with outstanding result and the Taiwan Halal Pavilion will introduce the halal industry of Taiwan to Malaysia. This marks the first ever press conference in Malaysia for Taiwan’s halal industry and should greatly increase the popularity of these products in Malaysia. Visitors can also immerse in fashion, beauty products and the increasingly trendy cycling culture in the Taipei IN Style exhibition area, and experience for themselves the perfect combination of fashion and sports Taiwan has to offer. According to the latest Global Muslim Tourism Index (GMTI) released by MasterCard, Taiwan is listed as one of the favourite non-OIC (Organisation of Islamic Cooperation) travel destinations for Muslim travelers. This is the first time Taiwan broke into the top 5 position and a clear testament of its efforts in attracting Muslim tourists. Muslim friends must visit the exhibition to learn more about the interesting attractions and food in store for you! In 2017, Skyscanner selected Sun Moon Lake cycling trail as one of the 8 most beautiful cycling routes in the world and is high on the recommended list. Taiwan bicycles have long been the world’s leading brands and manufacture 20 million units of high-end bicycle each year. Cycling is booming in Malaysia, and the vision of seeing world class Taiwanese bicycles on Malaysia’s beautiful cycling routes is highly anticipated. In addition to product demonstrations, there will also be several seminars and business exchange meets during the course of Taiwan Expo 2018. The three main themes are Digital Forum, Smart Transportation, and Healthcare Excellence Seminar; industry leaders will be exchanging their experience with Malaysian academia and exploring business opportunities with industry players. Taiwan Expo is a pillar of Taiwan’s New Southbound Policy and one of the many activities lined up for Southeast Asia. This year’s event calendar includes Indonesia, Philippines, Vietnam, Thailand and India. Malaysia has long been one of the most important trading partners of Taiwan and chosen as the stage for the grand finale of its 2018 outing. 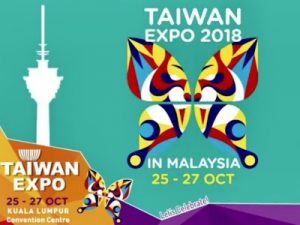 Taiwan Expo 2018 will run from 25th October (Thursday) through 27th October (Saturday) between 10am and 6pm at the Kuala Lumpur Convention and Exhibition Center. Entry is free and visitor only needs to register for a visitor pass.